The Secret Diary of Adrian Mole Aged 13 3/4 tickets at The Ambassadors Theatre, London. 2019. Find the best The Secret Diary of Adrian Mole Aged 13 3/4 musical tickets at The Ambassadors Theatre, West End. 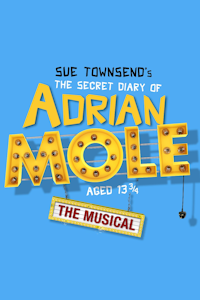 Set in 1980s Leicester, Sue Townsend's The Secret Diary of Adrian Mole Aged 13 3/4, follows the daily dramas and misadventures of Adrian's adolescent life. With dysfunctional parents, ungrateful elders, a growing debt to school bully Barry Kent and an unruly pimple on his chin, life is hard for a misunderstood intellectual who is only 13 3/4... To top it off, when new girl Pandora joins the class and captures his heart, his best friend Nigel steals hers. Can Adrian win her love and escape from his chaotic family life? Book by Jake Brunger. Music Pippa Cleary. Lyrics Jake Brunger. Lyrics Pippa Cleary. Producer Anthony Clare. Producer Ramin Sabi. Producer Knickerbockerglory. Producer Mark Puddle. Producer Curve. Director Luke Sheppard. Choreographer Rebecca Howell. Design Tom Rogers. Costume Tom Rogers. Lighting Howard Hudson. Musical Director Mark Collins. Music Paul Herbert (musical supervision and orchestrations). Director Jo Hawes (CDG - children's casting director). Saturday, 15th June 2019 to Saturday, 12th October 2019. Open 2nd Jul 19. 7 suppliers have been found to try and help you to get the best ticket deal. The Secret Diary of Adrian Mole Aged 13 3/4 tickets: The tabs above allow you to select between links to suppliers and date searching. Click on a supplier's logo to see their details and on the 'buy now' button to see and check the tickets on offer.